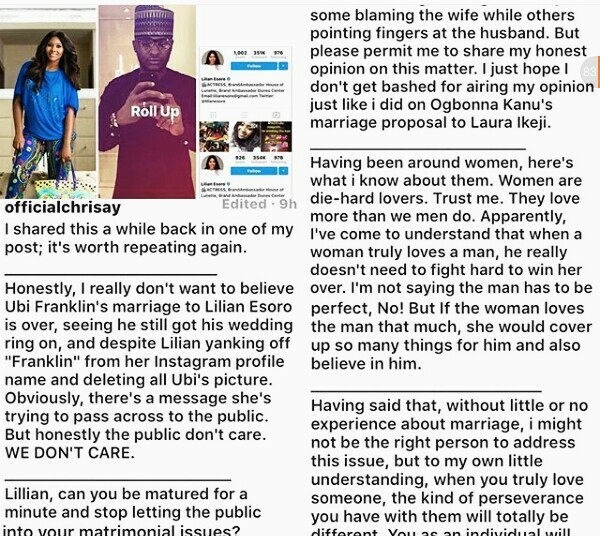 Chris Ayo Joseph writes an open letter to Lilian Esoro and Ubi Franklin. ~ CK Jacob: Nigerian Fiction And Lifestyle Blog. 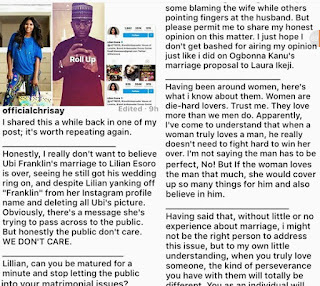 Chris Ayo Joseph writes an open letter to Lilian Esoro and Ubi Franklin. Nigerian journalist, Chris Ayo Joseph wrote an open letter to Nollywood actress Lilian Esoro and Triplemg Boss, Ubi Franklin about their marriage. "I shared this a while back in one of my post; it's worth repeating again. Honestly, I really don't want to believe Ubi Franklin's marriage to Lilian Esoro is over, seeing he still got his wedding ring on, and despite Lilian yanking off "Franklin" from her Instagram profile name and deleting all Ubi's picture. Obviously, there's a message she's trying to pass across to the public. But honestly the public don't care. WE DON'T CARE. Lillian, can you be matured for a minute and stop letting the public into your matrimonial issues? Apparently, so much has been said online about Ubi Franklin & Lilian Esoro's marriage hitting the rock; some blaming the wife while others pointing fingers at the husband. But please permit me to share my honest opinion on this matter. I just hope I don't get bashed for airing my opinion just like i did on Ogbonna Kanu's marriage proposal to Laura Ikeji. Having been around women, here's what i know about them. Women are die-hard lovers. Trust me. They love more than we men do. Apparently, I've come to understand that when a woman truly loves a man, he really doesn't need to fight hard to win her over. I'm not saying the man has to be perfect, No! But If the woman loves the man that much, she would cover up so many things for him and also believe in him. Having said that, without little or no experience about marriage, i might not be the right person to address this issue, but to my own little understanding, when you truly love someone, the kind of perseverance you have with them will totally be different. You as an individual will always play reasonable in every part in their lives. Now, talking about marriage vows being exchanged at the alter of God, permit me to ask this simple question. Why should real Christians go to the alter of God in the first place when he/she knows there's no such thing as genuine love in their heart but selfish desires? So, you marry a person you don't love? A person you don't respect? Because If you respect your partner and the alter where the name of the Almighty God is called, you can't come and make promises to mere humans and forget about it all; most especially now that a little child is a product of your matrimony. Like I'll always say, marriage takes both people being willing to work through the issues. A marriage only works if you're willing to work for the marriage and as well putting God first because God is Love. So Lillian, please permit me to say this with all due respect.. "Your marriage wasn't based on love my dear" and i honestly think you both don't love yourself that much. Because if you do, prior to your wedding I'm very sure there are behaviours that are evident if you have taken enough time to get to know your husband. Certain attitudes and habits of his should not be a surprise, because when you made those commitment to your husband, you were committing to his whole being. It's rare that people turn into a new person after marriage. So if your husband has something that bugs you, more than likely it bugged you prior to jumping the broom, now is the time you must deal with it. If it's really wearing you down, communicate how much it is affecting your relationship with him and see there is a compromise between you both. Accepting defeat or divorce is a no no at this point for you both, and as you know love heals all wounds. On a final note, i think it's high time you both take a break from posting your family issues on social media and take the time to pray for divine direction from God, that's what true Christians should do. Allow the will of God be done. It's my prayer that God heals you both fast. Can't wait to see you both hold hands together again at public events. Stay Blessed!